My small greenhouse is now stocked with nearly 20 Air-Pot Tender crop containers, these come in 10 litre and 14 litre sizes and are perfect for annual greenhouse plants. My dripper irrigation system is set up with a timer to control frequency and duration of watering. 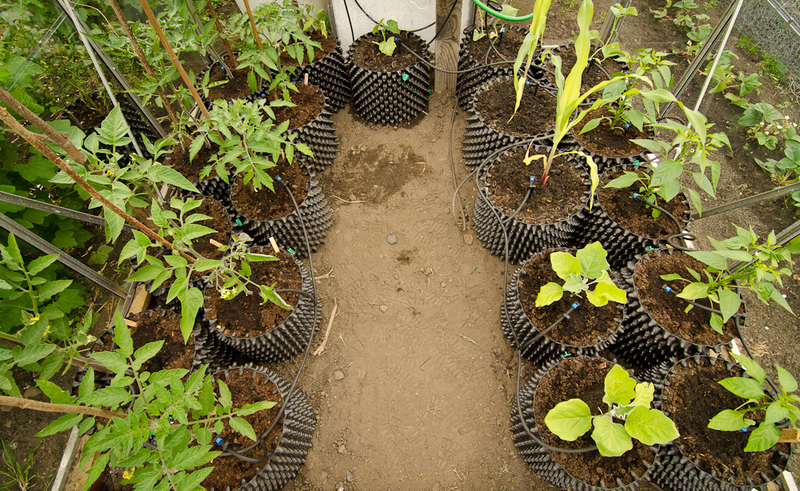 The drippers are adjustable and can be set to spray which spreads the water, avoiding dry patches in the pots. There is also an automatic vent opener so the greenhouse should look after itself for a while. I had some little cauliflower plants in modules which had over-wintered in the greenhouse, they were planted out on the plot in Spring but I had surplus plants, so as an experiment one went into a 10 litre Air-Pot. It stayed in the greenhouse while there was space and then went outside. 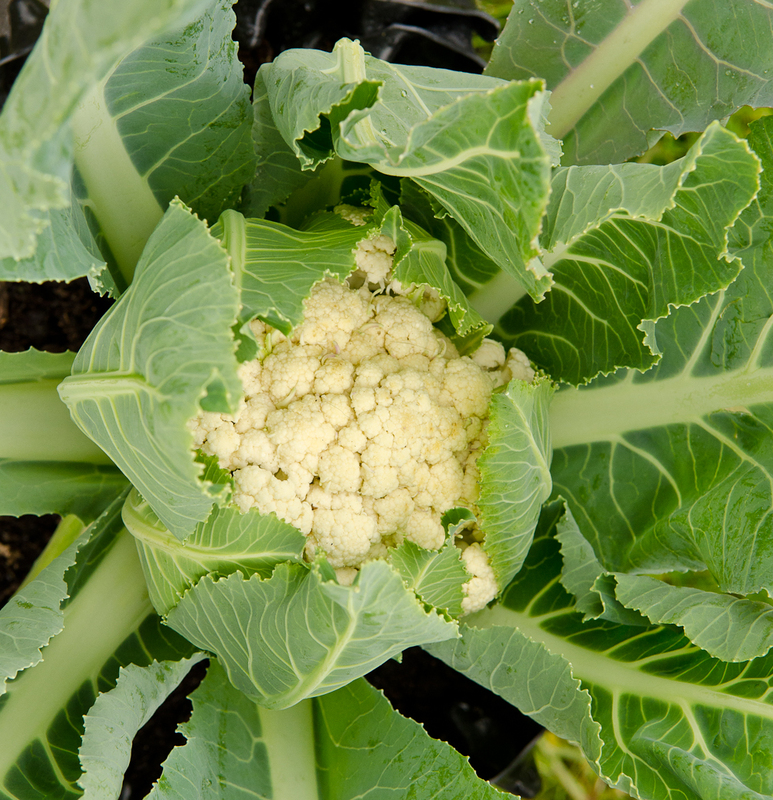 It grew well and now has a small but perfectly formed cauliflower ready to pick. 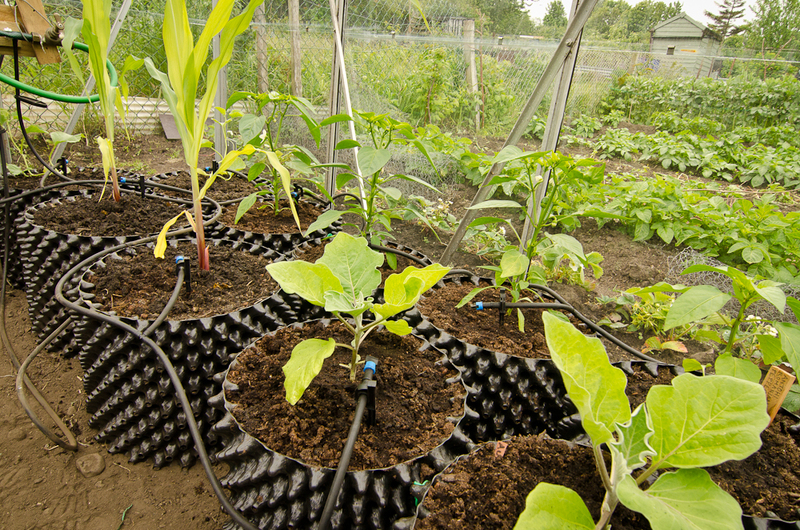 The allotment plants are not even close to cropping, so this could be a useful way to bring on a few early plants. I will be doing further experiments, perhaps with quick heading broccoli. I have been hearing from Gareth Cameron, an outstanding exhibition vegetable grower. It sounds like his Cumbrian garden has taken a battering from the storms & late frosts, but he has lots coming along in poly tunnels. I will be going to have a look at his onions in Air-Pot containers in the Summer, and see how his potatoes compare to mine. I think mine might be ahead at this stage. Not that it is a competition or anything. Gareth told me about a range of five powdered plant feeds by www.dragonflyeurope.com They are made entirely from natural ingredients and are formulated specifically for different stages of growth. There is also a foliar feed and a sort of ‘compost tea’ in a sachet full of beneficial bacteria, like a pro-biotic for plants. 10 drops Lavender oil, 6 drops Peppermint oil, 1 tbs Dr Brommers soap, 3 litres water.